On Drinking Coke in a Liminal State in Nepal | This Japanese Life. Posted on August 15, 2013	by E.
There’s a Tibetan word, “Bardo,” that refers to the space between different lifetimes. Here in Nepal, where Tibetan Buddhism lives unhindered, I’m surrounded by reminders of Bardo. On the top of the dome-shaped stupas are paintings of Buddha’s eyes, painted on four sides of a cube. Even at the corners, the eyes seem to be in pairs, surveying every direction. It always reminds me of my own position, staring out from my private tower between lives, looking to the past, present, future and any other space I can think to look at while trying to make sense of where I am. At a stopover in Shanghai I grabbed a cheap but fancy Cantonese meal and noticed the menu offered Ginger Coca Cola. Always a soft drink adventurist, I sprung. It arrived, warm in a teapot, with strips of fresh ginger boiled into it. It was mellow, not fizzy, and quite delicious. And it was a somewhere directly between America and China. Bardo, as the space between lives, is still a controversial proposition among Buddhists, who debate the instant-oatmeal version of reincarnation or the long-journey-back-to-human-form version (as seen in Japan). Buddhist psychology, though, emphasizes that the Bardo state happens on a smaller scale in our own lives: the moments “in between” one of our lives and the next, when our notion of self is jolted out of its continuity. A breakup, a marriage, a move, a child, a new job, a new house. Just before these leaps, we’re up there in our bardo towers, surveying every direction for advice on how to get across the terrain. Continuity is on my mind in Nepal, where I’m in a 21-day bardo between life in Japan, life in the US, and life in London and then China. At the stupa at Boudhanath, the largest eyed stupa in the world and a focal point of Buddhists on pilgrimage and in meditation, I’m walking in a circle spinning prayer wheels. Nobody knows how old this place is. It’s origin story goes back to 4, which is so old that I have to reiterate that it’s a year — The stupa is probably about 2009 years old. Spinning the prayer wheels- coffee canisters, here inscribed in Sanskrit with “om mani padme hum,” “praise the jewel of the lotus,” a kind of mnemonic device for the six bardos in Tibetan Buddhism. 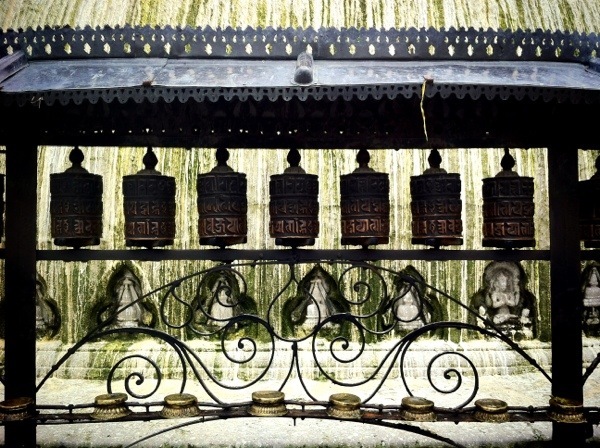 They spin like miniature prayer engines, contributing to the aura of the stupa – millions of hands have spun them before me, had their hands encrusted in the rubbed-off copper and birdshit that cover the wheels. I stop, and three women in robes pass by, spinning the ones I’ve already spun and continuing the circle around to where I would have gone. In Nepal they have a drink -imported from India- where they add masala spices to flat coca cola. The resulting mixture tastes suspiciously like raw egg. We ask the waiter if it has egg in it. Hands spin the same wheels since 4, 2009 years before I arrived, and will continue to spin in my absence. In Japan, they introduced Vanilla Coke just as I was selling off the last bits of my life. I’d had it often in America, and wondered if it would be subtler in Japan. It was identical. In Nepal, Coke is sold in glass bottles, making it more susceptible to light affecting the carbonation than, say, a can. The result is a less fizzy drink in general, made with real sugar as well, but the glasses are washed and sent back to the bottling plant to be reused. For this reason, nobody puts the bottles directly onto their lips. This post was uploaded using an iPhone in Nepal by candlelight during a power outage. Please forgive the resulting autocorrect errors. Also, I wrote a book, guys. 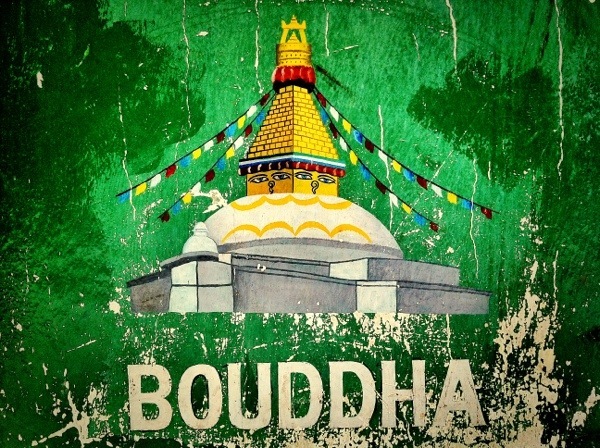 This entry was posted in Culture Shock and tagged Bardo, coke, Nepal. Bookmark the permalink. Very interesting about the different flavors of coke. I’ve only had the normal kind myself, I don’t think I’m adventurous enough to try the crazy flavors you did. I’m really amazed when I hear about or see things that have lasted as long as the temple you visited. Especially when they aren’t in ruins. This post reminds me of how hard it was to find Diet Coke when we went to Japan a few years ago. My boyfriend is a Diet Coke fiend and he was climbing the walls as he went through the classic withdrawal symptoms. Ginger coca cola sounds pretty good, like a cross between ginger ale and coke. Masala coca cola, not so much. 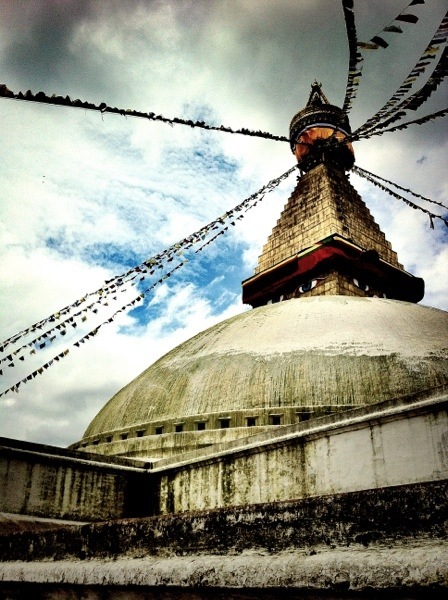 Pingback: On Taking Pictures in Kathmandu. | This Japanese Life.